foundation from which to grow. which allowed me to pursue my academic goals. equipment and for his excellent advice. acetonitrile-isopropanol-O.1 M phosphate buffer (pH 4.5)(25:3:72). extraction into chloroform, followed by a back extraction into acid. ranged between 94.5% and 106.0%. analogues with different aminosugar substituents. differences in the biological activity of the anthracyclines. and removal of the 4'-hydroxy gives 4'-deoxydoxorubicin (DEOXY). of the sugar to the aglycone. on the carbohydrate structure (8). attributed to their differences in pKa (13). to both host and tumor cells are produced by the anthracyclines. may increase sodium permeability and alter calcium handling (19). anthracyclines damage both tumor cells and cardiac tissue (2). of doxorubicin excreted in the urine have been reported (27, 28). 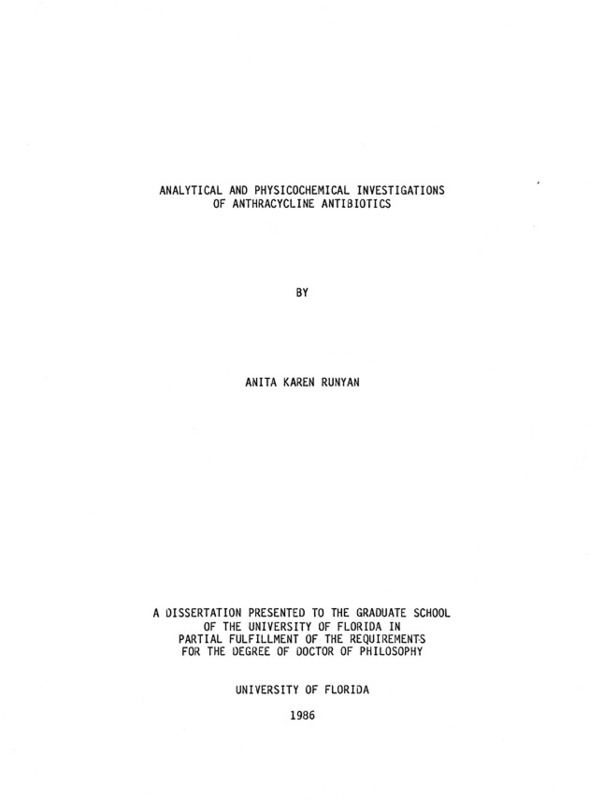 metabolic and elimination processes (29, 30). carcinoma, malignant melanoma and colon carcinoma (33). faster metabolic rate than doxorubicin (30). clearance of epidoxorubicin and/or extrahepatic metabolism (31). doxorubicin (24 to 48 hours) (38). attained by few other antitumor agents. bound in the therapeutic concentration range in humans. kinetics and a dependence on temperature and concentration (44). interactions with cell membrane components (e.g., saturation) (44). concentration and the tissue partition coefficient exists (47). of the drugs and their metabolites. and its metabolites in urine. be detected by this method (62). Column Mobile Phase Method of Ref. from day to day and re-equilibration was lengthy (52). 585 nm. The limit of detection was 1 ng/ml. wavelengths were 480 nm and 560 nm. commonly used because of its greater sensitivity and selectivity. 60% organic solvent in the mobile phase. phase of methanol-0.005 M 1-heptanesulfonic acid pH 3.5 (62.5-37.5). water (65:35 or 60:40) adjusted to pH 2.0 with phosphoric acid (73). buffered aqueous solution at pH 2 to 4 (Table 1-2). acid pH 2.3 (31:61:8) (56). ammonium format buffer pH 4.0 (30:70) mobile phase (57). glucuronide conjugates was also possible with this system (59). used to determine doxorubicin, daunorubicin, and their metabolites. (ammonium format buffer/THF, 1:1) to 0% A, 100% in B in 10 minutes. with a mobile phase of acetonitrile-0.05 M KH2PO4 (35:65) (61). (28:71:1) adjusted to pH 4 with 20% sodium acetate. Kotake et al. with 20% sodium acetate, and the applied potential was +0.7 volts. phase is separated, evaporated and reconstituted with mobile phase. such as Bond-Elut (Analytichem International) or Sep-Pak (Waters). which was injected into the analytical column. to cause free radical formation (18). attributed to the irreversible reduction of the side chain carbonyl. hydroxyl group at C-7 (77). which give practical limits of detection around 5 ng/ml in plasma. possible alterations of the chromophore in biological systems. and simplicity of operation (78). was performed under various chromatographic and detector conditions. chromatographic conditions to optimize the HPLC-EC system. studies were used to support the choice of an optimum HPLC-EC system. to single dose investigations with one notable exception (27). rates of 25, 50, 100, 200, 500 and 1000 mV/s were used. system had dual coulometric detectors with a precolumn guard cell. factor dependent on the current and the resistance in the cell (81). electrolyte outside the sample cell (82). is used to prevent migration currents and ensure conductivity (81). compounds, determined by the peak heights, was greater at lower pH. 25 mV/s. d) scale 0.79 pA/cm. +1.0 V at pH 4.
with scan rate to the extent of the other compounds. scan rates but was about half the peak height of the cathodic peak. This again indicates some type of irreversible process. -0.6 V at pH 5 to 7, to -0.7 V to -0.75 V at pH 8.
sample is oxidized or reduced (84). which is oxidized and gives rise to the measured diffusion current. This conclusion is supported by the cyclic voltammetry studies (Sec. anthracycline moiety which is detected. the first detector decreased the response from the second detector. consistent with the results from the cyclic voltammetry studies (Sec. detector compared with the BAS detector (Figure 3-5). The chemicals and reagents used were described in Section 3.1.1.
expanded to include all the compounds described in Figure 1-1.
filter and degassed by sonication prior to use. buffer (pH 8 to 9) in a 15 ml Teflon lined screw capped test tube. vortexed for 30 seconds and centrifuged at 2000 rpm for 5 minutes. mobile phase and 20 ul were injected onto the analytical column. x 4.6 mm) were packed using the upward slurry technique (85). H3PO4 (pH 2.0) and shaken for 30 seconds with 1 ml of chloroform. were injected onto the HPLC column. a See Figure 1-1 for key. solute and an unretained compound, respectively. the aqueous phase were injected onto the HPLC column. isopropanol produced the highest selectivity and resolution values. of CN1 peak at base (estimated when Rs<1.0). Table 4-3. Chromatographic Parameters of CN on SAS Hypersil Column. a See Table 4-2 for explanation of parameters. slightly less resolution and little difference in selectivity. with a mobile phase of pH 4.5.
the concentration of the surfactant in the mobile phase (86). temperature was studied in an attempt to improve the chromatography. temperature of the system also increases column efficiency (86). Zorbax column. Some typical chromatograms are shown in Figure 4-3.
water (25/75);H-- THF/SDS in 0.01 M KH2PO4 (25/75). techniques for the analysis of CN and related compounds. phase. The other compounds were expected to show similar behavior. anthracycline antibiotics using EC detection. rate: 2.5 ml/mmin. Detection: Amperometric at +0.8 V.
narrower and more symmetrical peaks than the 5 uim Zorbax ODS column. required for the separation of its two diastereomers (Figure 4-5). modifier content of the mobile phase or increasing the flow rate. 4 position is obtained from the retention data for DMDR and DNR. structure activity relationships of the anthracyclines. material eluting before the peaks of interest was vented to waste. background current and detector noise. plasma, the organic solvent and volume ratio of organic solvent(s). to waste. At other times, the mobile phase was recycled. recovery was obtained around pH 9.
for most compounds and was selected for further recovery experiments. resulted in good recovery (71%) but poor chromatography. modifications in sample preparation to eliminate interfering peaks. the compounds (Sec. 4.2.3) from greater than 80% to 60 to 80%. improvements in the liquid-liquid extraction procedure were continued. a Relative standard deviation, RSD(%) = (SD/Recovery) x 100.
diastereomers were found to be unstable at pH 2.0.
reference electrode producing a constant reference potential. Reference electrodes were replaced approximately every two months. a Amount in 200 ul injection of an aqueous solution. Standard error of the slope. Standard error of the Y intercept. Standard error of estimate of y on x.
a See Table 4-1 for chromatographic conditions. b See Figure 4-1 for key. Concentration 10 ng/ml for each drug. the drug in aqueous solution, expressed as a percentage. d Relative standard deviation; n=5, RSD(%) = (SD/Recovery) x 100.
of Anthracycline Antibiotics in Plasma by HPLC-EC. b See Figure 1-1 for key. linear (r>0.990) with near zero intercepts (Table 4-13). Ug/ml were 62.94%, 80.57% and 74.29%, respectively (Table 4-14). Extracted Urine Samples of DOX. Standard error of estimate of y and x. Table 4-14. Absolute Recoveries of Doxorubicin from Urine. in aqueous solution, expressed as percentage. b Relative standard deviation, n=5. 7.4) at room temperature (25C) was determined over a 6-hour period. room temperature and at certain time intervals 0.5 ml was removed. added to the 200 ng/ml and 1600 ng/ml solution of DOX, respectively. ng/ml and 0 to 1600 ng/ml. 1000 ng of internal standard (DNR) were added to each 0.5 ml sample. standard (Table 4-1) were added. anthracyclines was determined by ultrafiltration. An Amicon Corp.
compounds. The samples were extracted as described previously (Sec. ml of 0.2 M H3PO4 (pH 2.0) and shaken with 1 ml of chloroform. extracting the solutions (0.3 ml) by the method described. saline and once with pH 7.4 buffer with subsequent centrifugation. with pH 7.4 buffer at plasma fractions of 0.05, 0.1, 0.2, 0.3 and 0.4.
from buffer solutions of known CN concentrations. 1600 ng/ml. Stock solutions were prepared in physiological buffer. used to determine the sample concentrations. standard was added and 200 0l were injected onto the HPLC column. tubes, centrifuged and the plasma frozen (-20C) prior to analysis. and cisplatin are given at three-week intervals prior to surgery. before DOX administration and at various time intervals thereafter. released from the hospital, which was usually after 24 to 36 hours. estimate the stability of the compounds at pH 7.4 and 25C. compromise the protein binding and RBC partitioning experiments. the HPLC column. Temperature = 25C. m, and p refer to the RBC fluid, membrane and plasma, respectively. be studied by physically separating the various components of blood. isolated by centrifugation from blood. membrane (D ,p) are given by equations 5-4 and 5-5, respectively. course, this assumes that there is no protein in the plasma water.